It was just a matter of time. 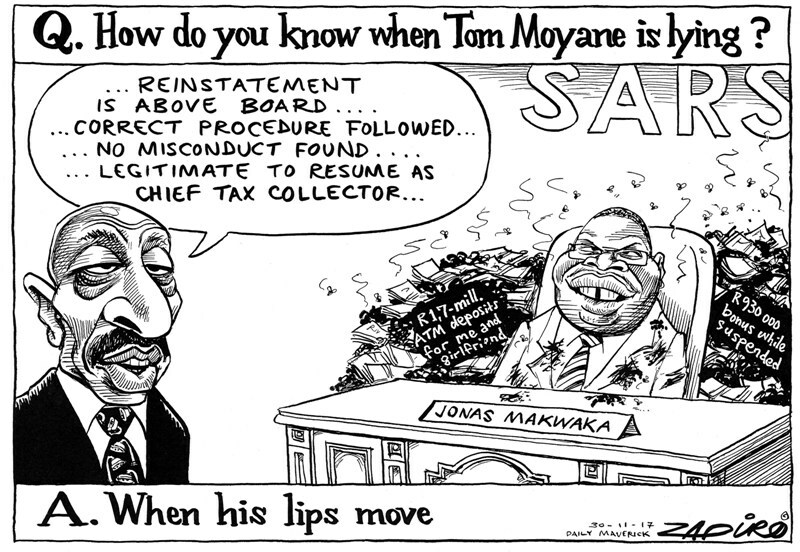 It was clear that Tom Moyane, the South African Revenue Service commissioner, was in the firing line. President Cyril Ramaphosa did not act immediately. He has given those apparently implicated in the Gupta infection of the state just enough time to start feeling secure. Then he acted. Ramaphosa asked Moyane to resign, but he refused. Now he has been suspended. A disciplinary process will now ensue. The decision to suspend Moyane “follows a meeting in which President Ramaphosa informed Mr Moyane that he had lost confidence in his ability to lead SARS and offered him an opportunity to resign with immediate effect, which Mr Moyane declined”. The presidency issued a statement late on Monday night. The President indicated that as SARS commissioner, Moyane “holds a high position of trust in the management of the country’s public finances. It was, therefore, necessary to act urgently and immediately to protect the institution and place it on a path to stability and recovery”. Ramaphosa was concerned about the management of VAT refunds which had brought the SARS “into serious disrepute and potentially jeopardised the integrity of the SARS as collector of revenue and adversely affected tax morality among taxpayers”. Here is the Gupta link the Moyane tale – although Ramaphosa did not go into the details of this matter. There is a mountain of evidence, however, that Moyane instructed SARS to make VAT refunds to the account of Terbium Financial Services – a third party and not the registered VAT vendor which was the Gupta company, Oakbay. This is in contravention of provisions of the VAT Act. The amount paid to the Guptas amounted to R70 million. Only yesterday – Monday 19 March – Moyane blamed the messenger, the media, for misrepresenting the good work of SARS (see full statement below). In the SARS statement Moyane accused the media of focusing “all its venom” on himself by accusing him of illegally authorising a VAT payment amounting to R70 million “to a taxpayer” – he did not acknowledge the Gupta family – “despite ample proof that he had no role in the payment and had acted within the law”. The president’s other concern about Moyane’s management was the handling of the matter of the chief officer for business and individual tax Jonas Makwakwa. “His treatment of the report given to him (about Makwakwa) by the Financial Intelligence Centre, and his failure to immediately report this to the Minister of Finance,” had raised the president’s concern, said Khusela Diko, spokesperson to the president. The Minister of Finance that Ramaphosa was referring to was Pravin Gordhan at the time of the FIC report – provided to SARS in mid-2016. Makwakwa resigned last Wednesday, 14 March. Makwakwa apparently misled SARS over the appointment of the National Integrated Credit Solutions (NICS) as one of eight debt collectors to recover billions of rand in debt owed to the taxman. NICs was appointed despite being linked to payments of money to Makwakwa’s personal account. It was this matter which was raised by the FIC. The FIC traced the payments by the Department of Water and Sanitation to NICS. Shady figures who live in the shadowy world of state capture deserve to be suspended after nighfall. No new dawn for you Tom Moyane. Goodnight and Goodbye. The allegation is that some R1.2 million was paid to Makwakwa between 2010 and 2016 although Moyane refers to a lower figure of “over R400 000” (See below). TimesLive reported last week that Makwakwa declared no relationship with NICS and had not declared that he had been a director in Biz Fire Worx, a company where the money from the water department ended up before allegedly being paid into his personal account. Makwakwa resigned ahead of SARS suspending him. At the first and last main budget briefing – in February this year – delivered by then Finance Minister Malusi Gigaba, the minister indicated that action would be taken against Makwakwa. He did not, however, indicate that there was any action about to be taken against Moyane – who was sitting alongside Gigaba at a media briefing at parliament, which was part of the routine lock-up of journalists ahead of the tabling of the main Budget. Significantly Moyane never attended when Gordhan was Finance Minister. In the face of evidence that Makwakwa was deeply embroiled in wrongdoing, Moyane stood by Makwakwa even on the day of announcing the latter’s resignation. “I wish to announce that Mr Jonas Mashudi Makwakwa has resigned…,” but he added, “before I do that, it would be prudent to state that in his letter of resignation, Mr Makwakwa has indicated that he is resigning for personal reasons. 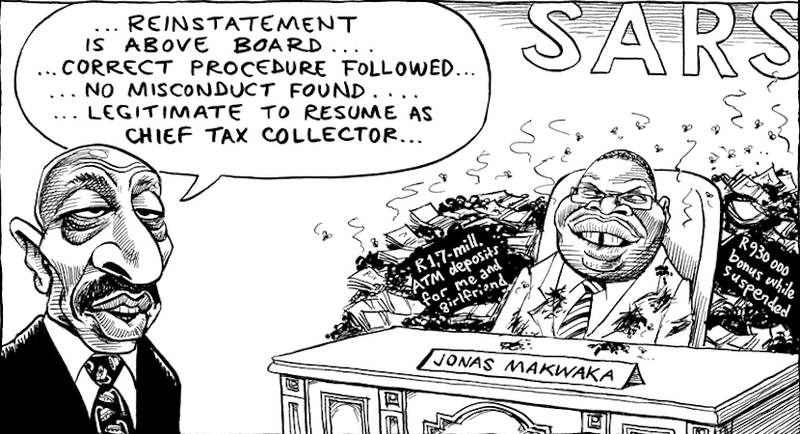 He regards this as being an opportune moment for him to exit SARS after being cleared of all the allegations of impropriety against him.” Moyane said Makwakwa had made his personal tax information available to Parliament for scrutiny “and for public accountability”. But Moyane reported last week that allegations emerged of impropriety against Makwakwa by the FIC in May 2016 – nearly two years ago. He acknowledged that the Directorate of Priority Crime Investigation – better known as the Hawks – had investigated allegations of corruption, money laundering and racketeering involving Makwakwa. More recently, Moyane reported, there were the allegations “in respect of the selection and appointment of New Integrated Credit Solution” which he described as a debt collection agency. Moyane claimed that SARS did not receive “the much-needed assistance from the FIC” and the process then “took longer than anticipated”. With hindsight, Moyane added, the differences between the FIC and SARS on this matter “should have been resolved speedily”. Tom Moyane says so. More brilliant cartoon work available at www.zapiro.com. Moyane said Makwakwa’s tax records would be made available to the standing committee on finance of parliament as would the Hogan Lovells report – which incorporates the report by the PWC. “As I understand the allegations‚ Makwakwa was conflicted as he failed to declare a potential conflict of interest‚ acted dishonestly‚ failed to act fairly and failed to recuse himself from the adjudication as the circumstances duly required,” Moyane finally acknowledged. Ramaphosa has suspended SARS boss Tom Moyane with immediate effect. Big winds of change blowing through state agencies. Moyane reported that an investigation “will proceed to probe the allegations of irregularity surrounding the appointment of NICS. The matter will also be referred to the DPCI for criminal investigation”. President Ramaphosa’s office said an acting SARS commissioner would be announced by the Minister of Finance Nhlanhla Nene. Pretoria, 19 March 2018 – The South African Revenue Service (SARS) wishes to express its deep concern and disturbance at the ongoing media onslaught that threatens to undermine the integrity of the organization. SARS wishes to acknowledge that the media is an important institution that plays a pivotal role in our society. In fact, the average citizen, especially taxpayers, rely on its portrayal of SARS for fair and balanced views. But SARS has observed and witnessed an unrelenting media attack that is skewed to project a misleading and unsubstantiated tone that is aimed at denting the reputation of the organization. 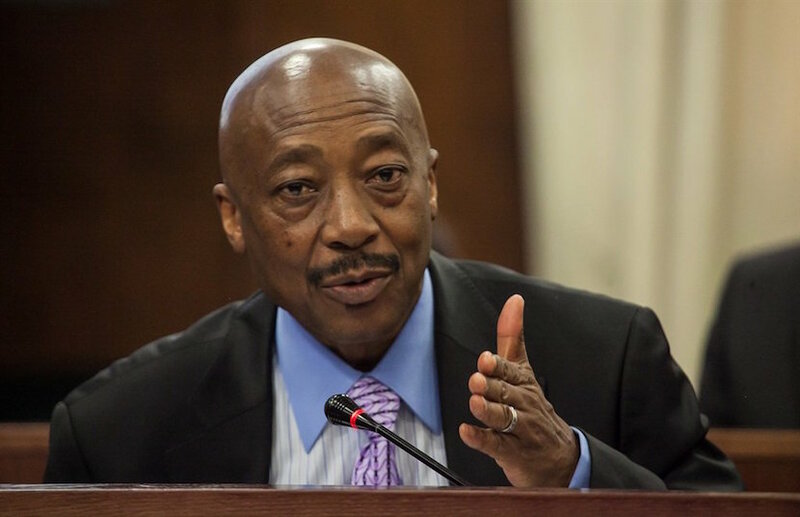 The latest assault focused all its venom on the SARS Commissioner Mr Tom Moyane by accusing him of illegally authorizing a VAT payment amounting to R70m to a taxpayer, despite ample proof that he had no role in the payment and had acted within the law. Over 55 Customs clients enjoying special benefits after being awarded Preferred Trader status since May 2017. SARS respects media freedom and its role in holding office-bearers and public servants to account. Furthermore, the appreciation extends to the contribution of the media in exposing acts of criminality and corruption. SARS however, humbly requests balanced reporting and fairness. SARS was pleased and has welcomed His Excellency, President Ramaphosa during his State of the Nation addresswhere committed to ‘Shortly appoint a Commission of Inquiry into Tax Administration and Governance of SARS’. It is to that end that SARS believes all this malicious and untruthful allegation will be better ventilated and dispelled at the envisaged inquiry. It is to this end that SARS humbly impresses on the President to find time in his busy schedule to finalize the details of the said inquiry. It is only through such a thorough and transparent process that the true facts regarding SARS will be established and all media manufactured narratives will be exposed.